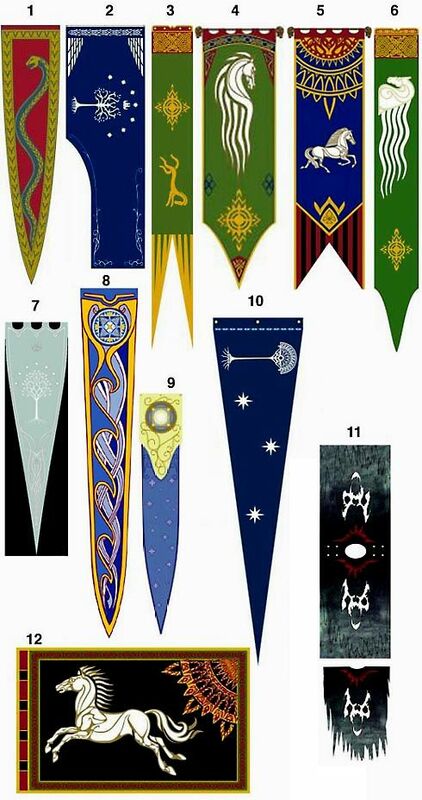 Now that I've been feeling all Middle Earthy, I've been scouring Pinterest for suitable inspiration for shield and flag designs. 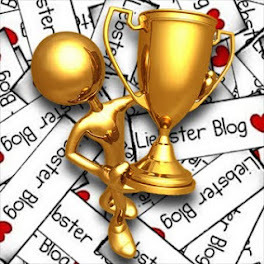 A lozenge is for males and circles are for female characters. 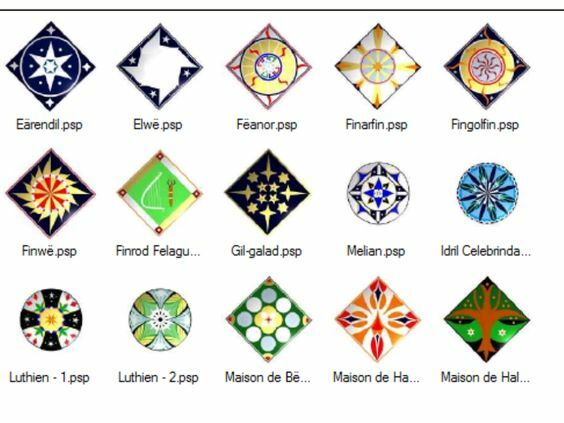 But they look like quilt designs to me and aren't quite bold enough for flags. 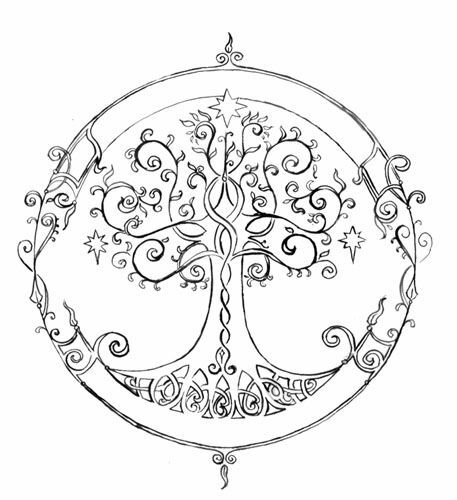 Rohan and Gondor naturally have the most results with their clearly defined symbols. This page being a fine example. 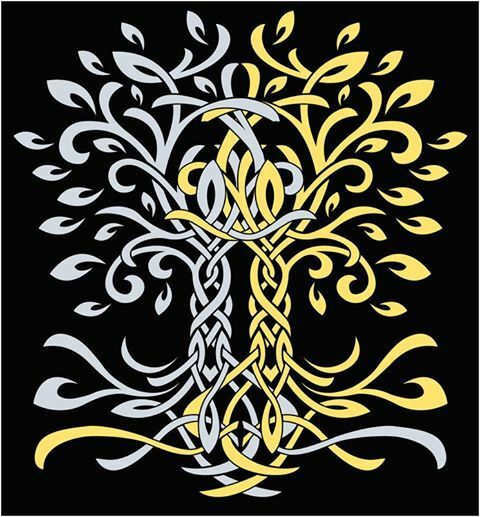 But as you can see there are some nice elvish designs in the mix too. Plus one that might do for Angmar. 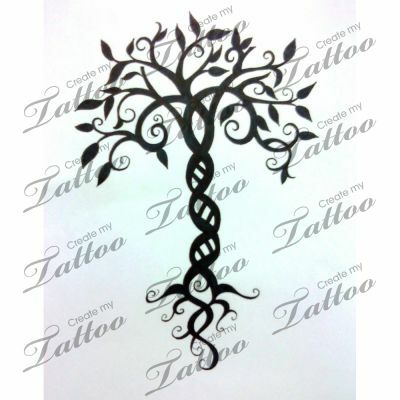 Of course trees and stars aren't just for Gondor. 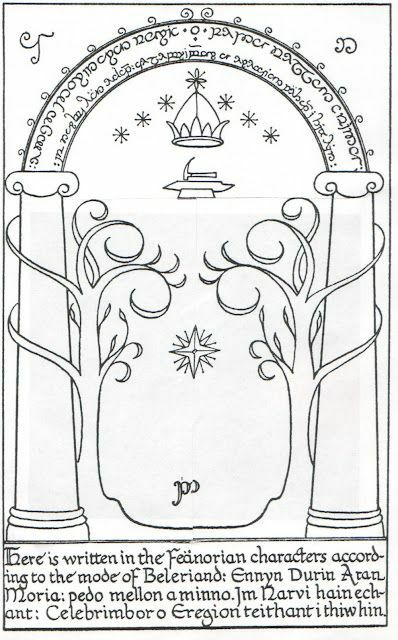 The design over the west gate of Moria as reproduced in most editions of The Lord of the Rings mixes motifs from both the realm of Kazad-Dum and the elvish realm in Hollin. 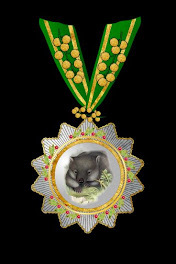 Perhaps in a gold on white? Gold and/or silver on blue? Noe to practice on paper before trying to paint it on a shield less than a half by three quarter of an inch! 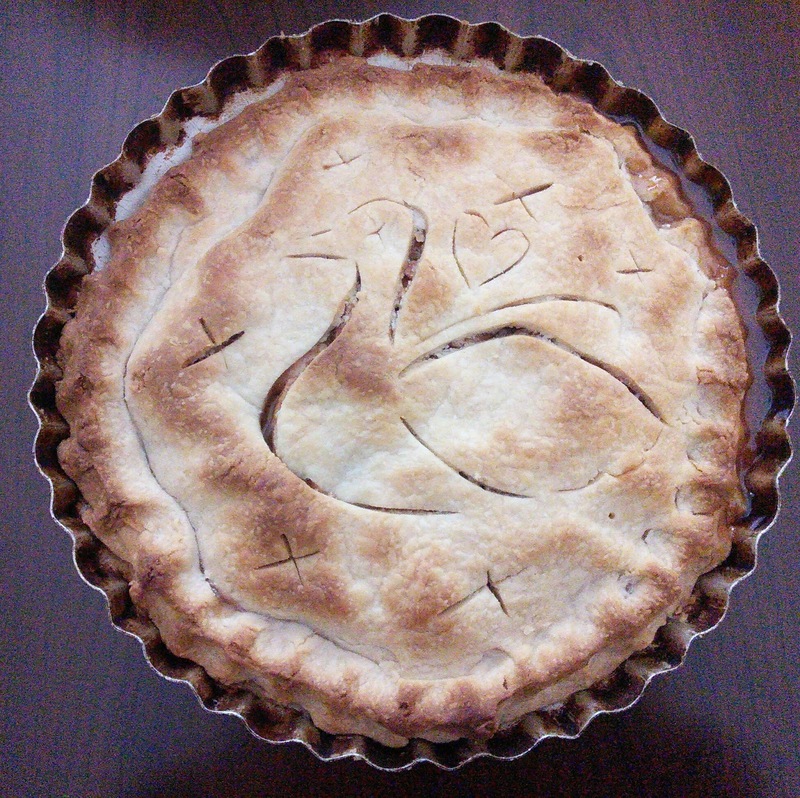 The pie above is made from apples from our own tree. Since we are trying to watch our diets these days I don't get pie nearly as often as I'd like. But on feast days dietary restrictions are set aside, otherwise it's just another day, isn't it? 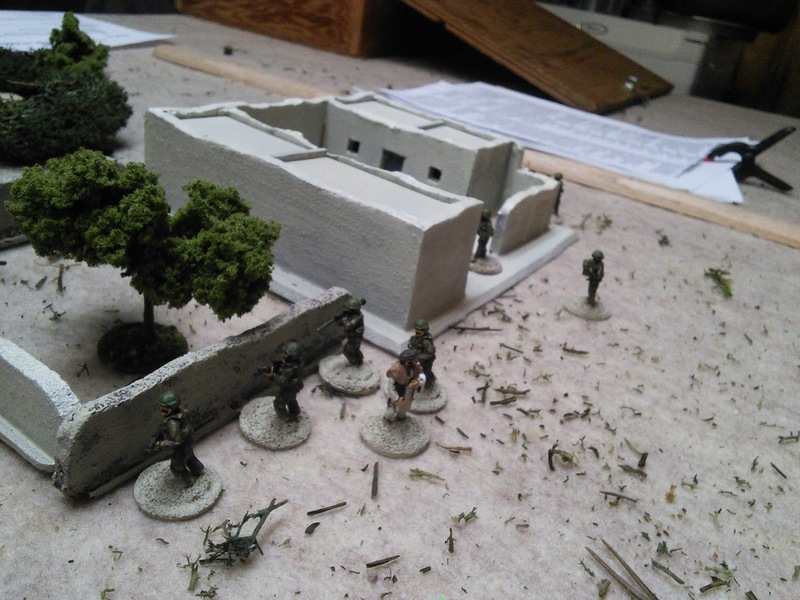 This past weekend I also received my portion of the order of figures from Sergeant Major Miniatures that I'd made with the Mad Padre. These are the old Vendel Fantasy figures, now being sold under the Bloody Day name at SMM. I wasn't sure really which way to go. Order some of everything? Or order a complete force for one race? I eventually decided on a compromise of sorts. 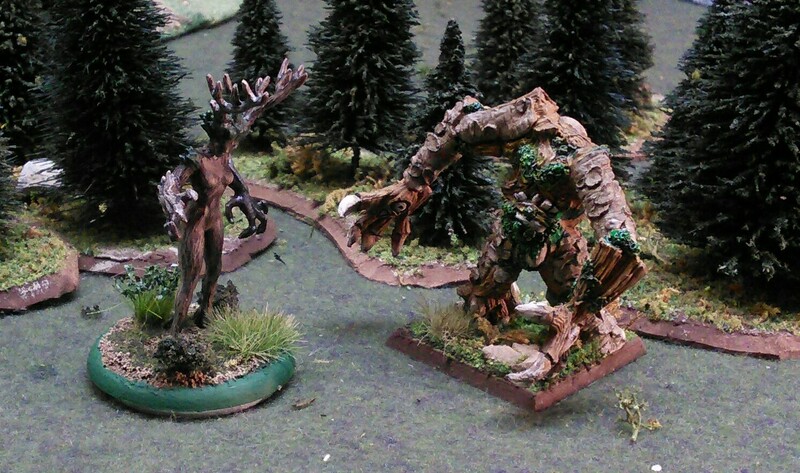 For the elves some armoured up Noldor to reinforce Naleth (aka Elf Girl) the Wise and Stone Bark (aka Tree Man). 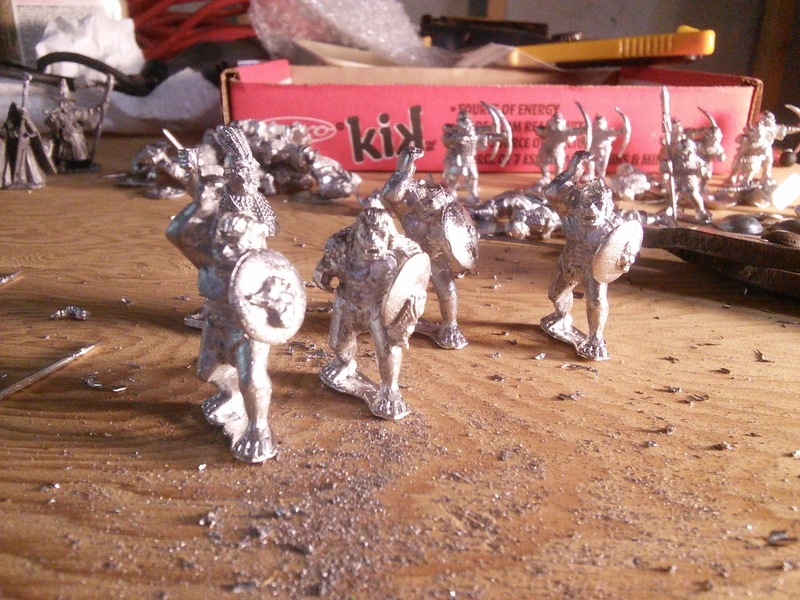 A pack of 4 armoured spearmen and the Elf king pack will give me a unit of elite foot and two heroes (reduced figure elite foot with magical weapons). 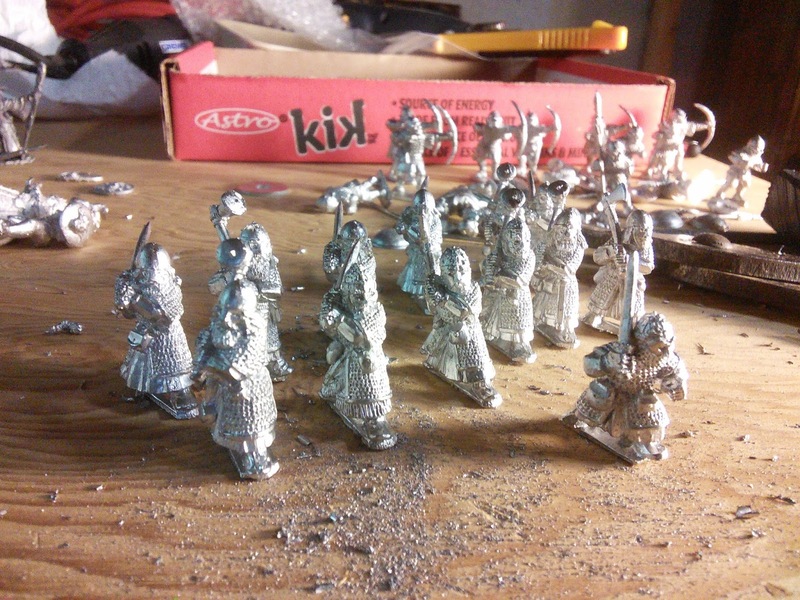 Also for the Good Guys I opted for a small contingent of Dwarves from Khazad-Dum. 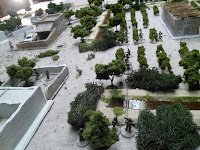 A pack of 8 heavily armoured huscarl and a pack of 5 dwarf Lords will give me two units of elite foot and a hero all with two handed weapons and long mail hauberks. Finally to add to the Legions of Angmar I ordered two 8 packs of small orcs attacking and an 8 pack of small orc archers. 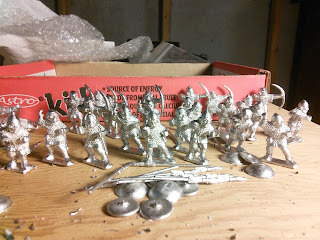 These will form two units of light foot with bows. 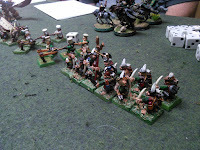 A pack of 4 trolls will be a reduced figure unit of bellicose foot. Being older models there is some light flash along the mould lines. Spear armed troops have separate spears and shields. The inclusion of spears makes me happy. Open handed there is the easy option to use wire spears if you choose. But suitable wire or purpose made wire spears are harder to find than you'd think, so at least your figure comes with a weapon. 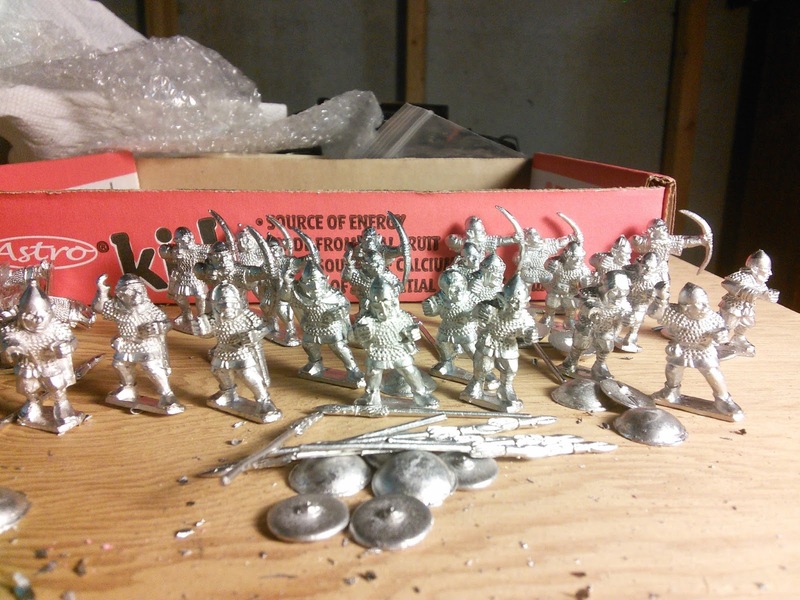 I HATE buying spearmen and then having to source the spears separately. 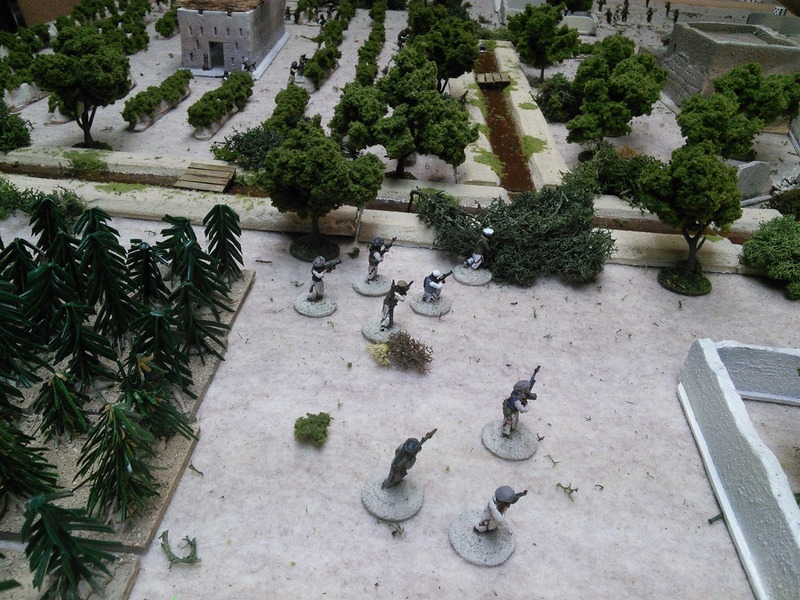 It would be like buying riflemen and having to buy the rifles separately. I decided that my Elven King would look better waving a sword so I found one in my bits box. One orc was sporting a very 80s mohawk which I trimmed off. 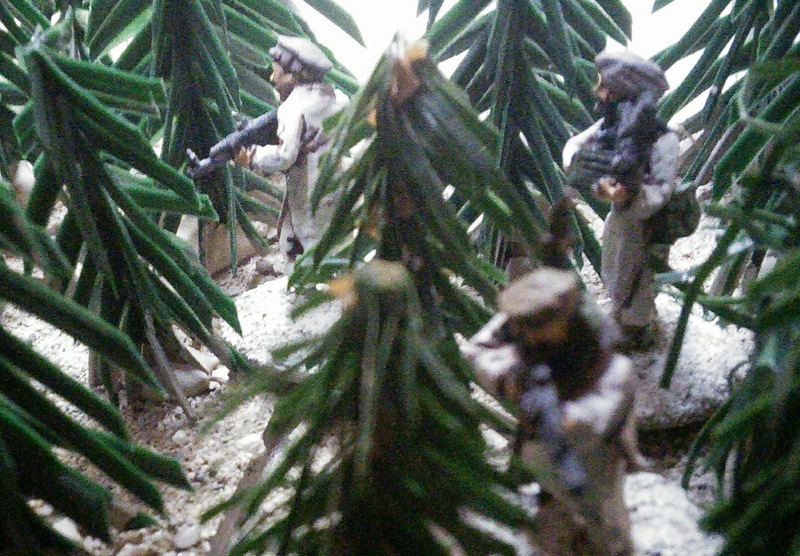 The poses are all a bit stiff, but the details are well done. 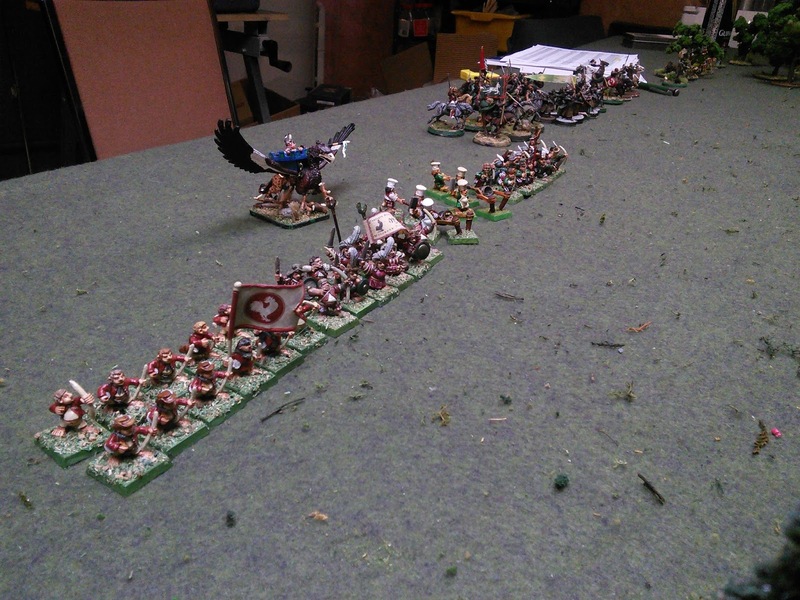 The dwarves are in very Anglo-Saxon style armour and the Lords have more ornate helmets with face masks. The elves look quite believable. Not the wasp waisted effeminate mincers that seem popular. 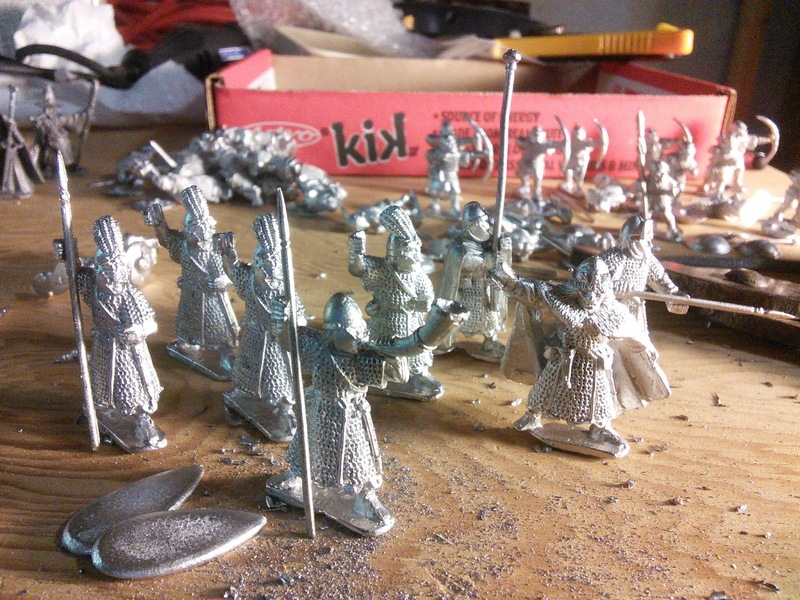 These figures look like mighty Noldor who could inspire terror in the hearts of the servants of evil. 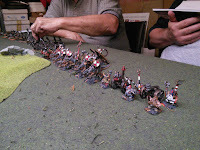 The orcs don't look ridiculous and cartoony like WFB orcs. They are wearing mail shirts, pants and boots as described in Lord of the Rings. Half of them are sporting a nice variety of helmets without gratuitous spikes or horns or skullz. The trolls are a bit disappointing, being only a bit bigger than the Elf warriors. But they are at least muscular and savage looking unlike the spindly stupid nose pickers inspired by D&D one can find on the market. Three of them have shields with faces stuck on. Because of the high relief, I assume these are meant to be the actual faces of defeated enemies adorning the shields. Overall I am quite pleased. And for 2 bucks a figure the price isn't horrible. 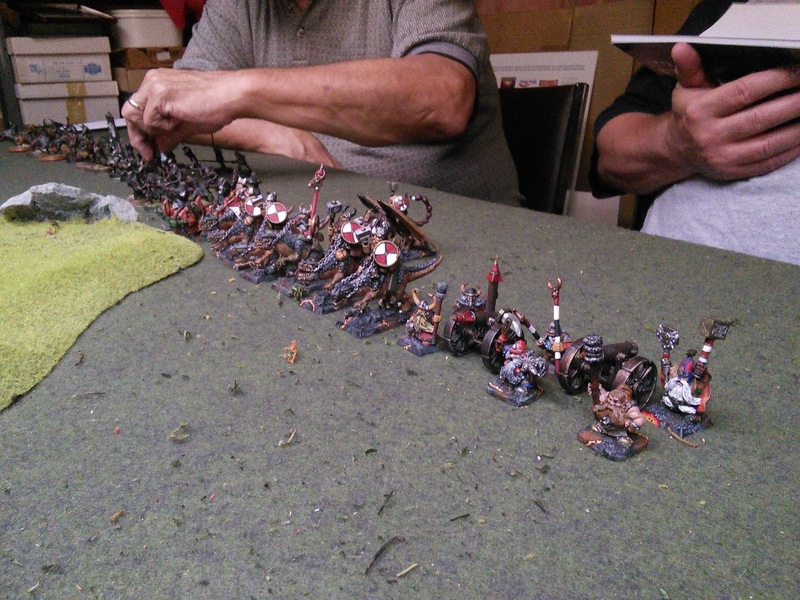 Once I get these painted and on the table I'll have to see what else I need; wolf riders, bigger uruks/hobgoblins, more elves and dwarves surely? Now I have to decide on badges etc. Finally, and very suddenly, not one, but two games! The Mad Padre contacted me last weekend about when I was available this fall for Roto 3-16 of OP Thundering Dice. This weekend was the only one free until after Remembrance Day so he made a rapid deployment on Friday for an overnight stay. Friday night we played Dragon Rampant. 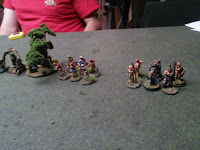 Pasha Dan, Brett and Mikey also came over for a big silly 6 warband smash up. 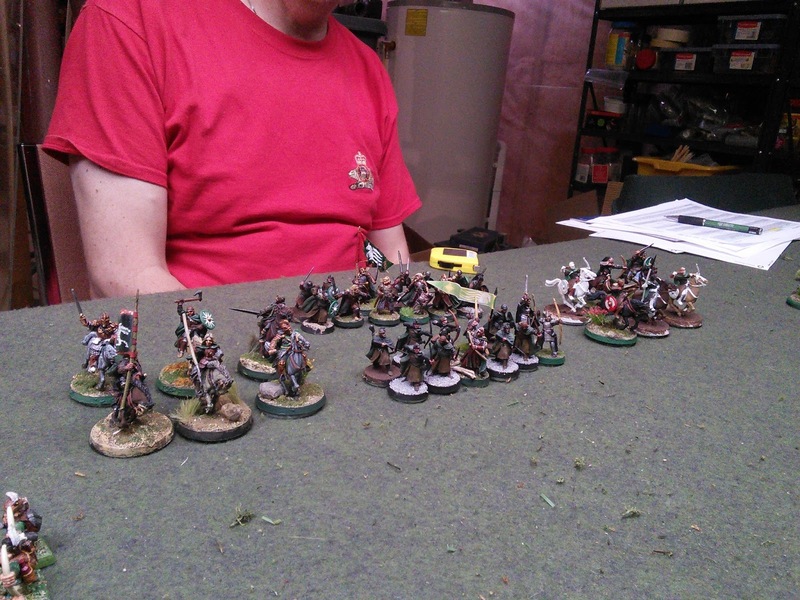 Brett brought his old Warhammer Fantasy hobbits who allied with the Padre's Rohirrim and Victorian Faerie elven band. 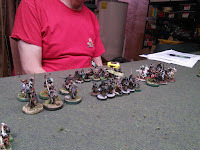 On the evil side were my Black Company, Pasha Dan's old WFB Chaos Dwarves and Mikey running the Padre's Isengard Uruks. 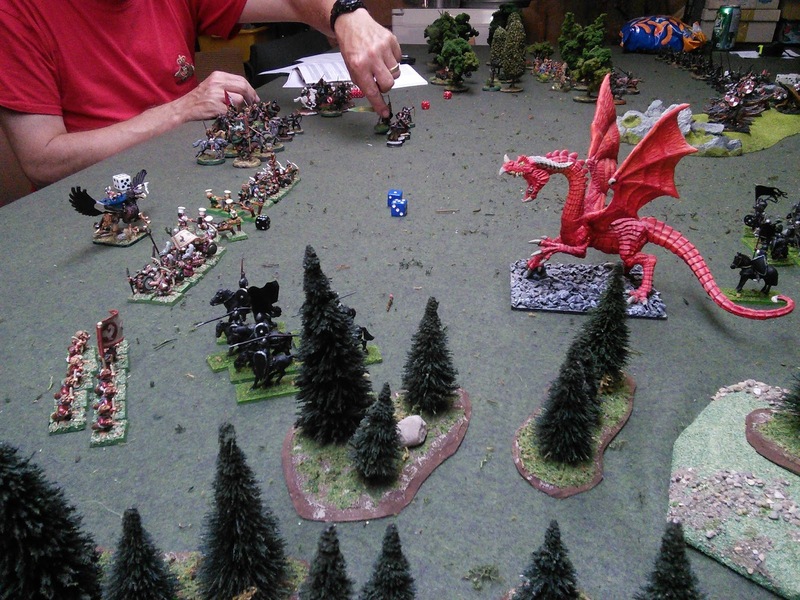 On the left I faced the hobbits. 4 units of elite shooters. 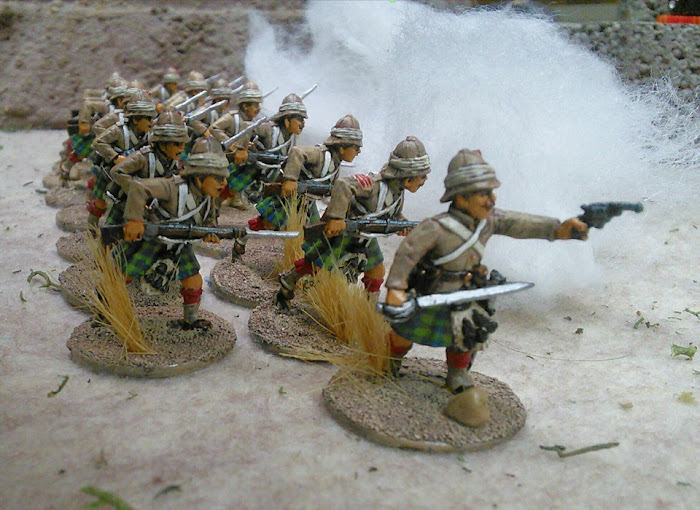 The hotpot launchers were a reduced figure unit with weighty projectiles. Stupidly I advanced in an uncoordinated fashion and let him concentrate on, and shoot up each of my best units in turn, effectively recreating the battle of Agincourt, with me as the French. 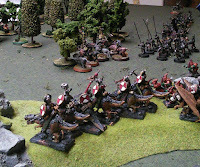 Morithol ("Dark Helmet") my commander did charge into the hotpots and lay about him with his venomous Sword of Angmar. So he routed the cooks, but got turned into a pin cushion. 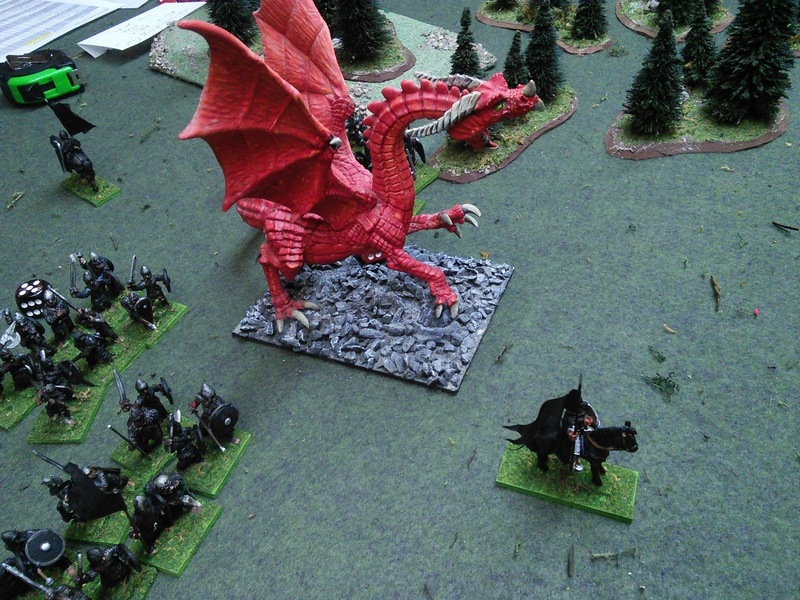 The heavy foot didn't last long after that and the hobbits had dragon steaks for dinner. Hobbits surge forward to victory and a barbecue! 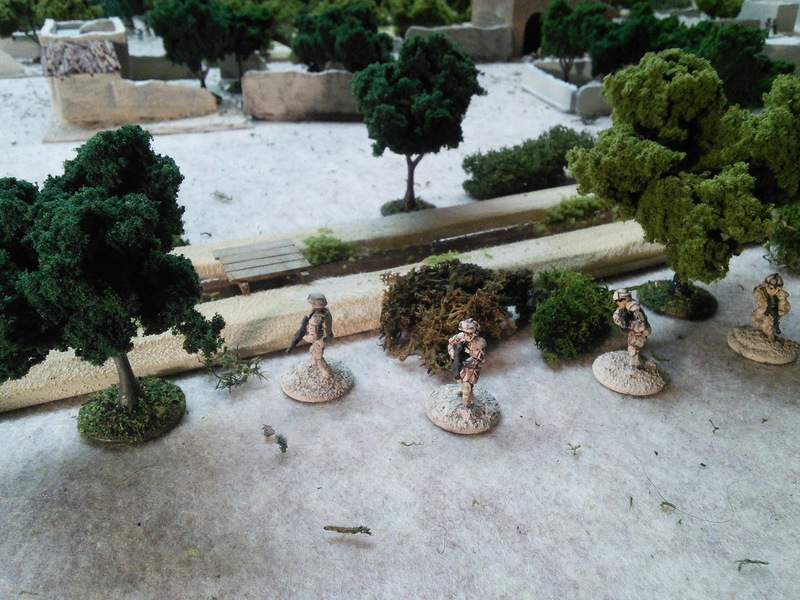 Over on the other flank, Mikey surged towards the woods to attack the Padre's naked nymphs. 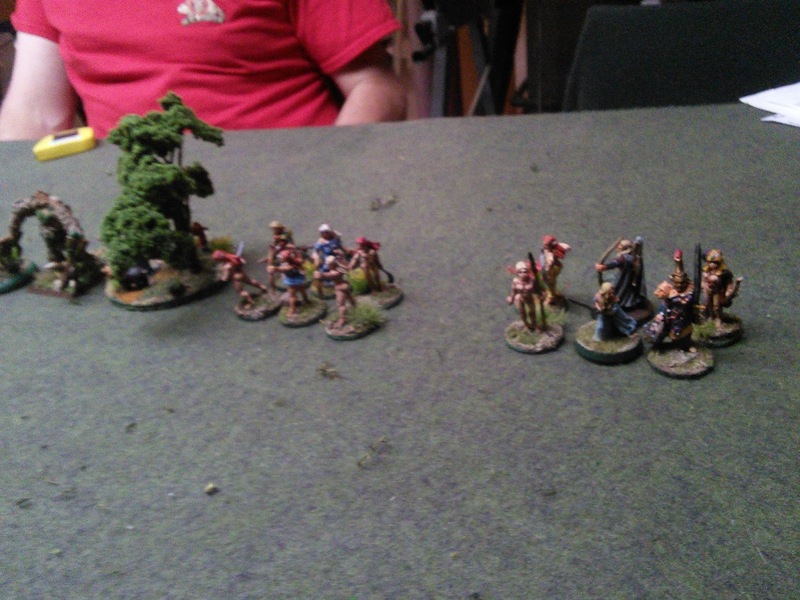 The Padre was frustrated by bad rolling and the skirmishing Faeries didn't skirmish. 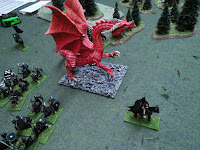 Most of the battle was fought by Treeman, who took on warg riders, spear uruks, skirmishing goblins, chaos dwarves riding lizards and the dwarf general on his manticore before finally going down. 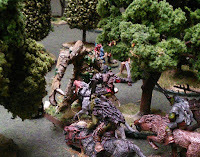 His companion, Treegirl, (a Bombshell Miniatures "Forest guardian") also took on the lizard riders exacting a cruel revenge. "Ooh! What handsome bark you have!" 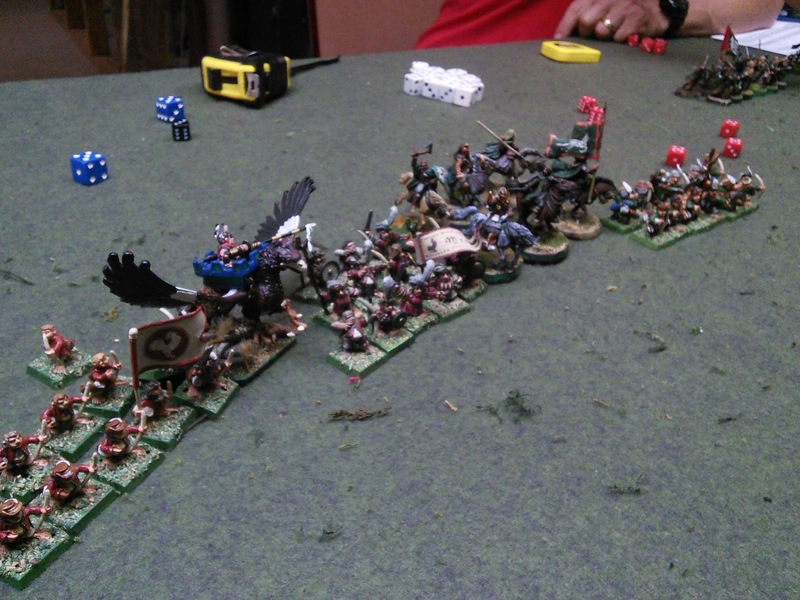 In the centre the Rohirrim and the Dwarves were both slow to get moving. 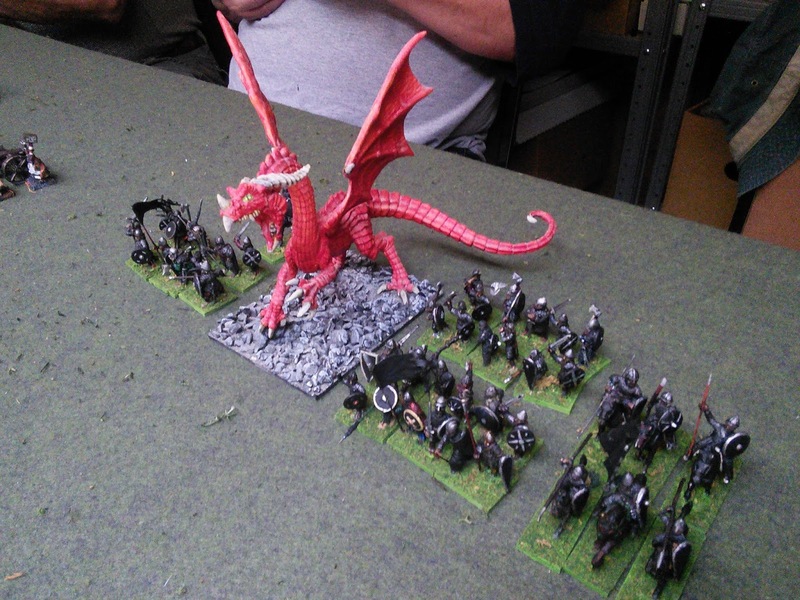 Theoden sent a unit of elite Riders to reinforce the hobbits, but they weren't needed and just watched the effects of Hobbit archery until asked to join in some barbecued dragon. 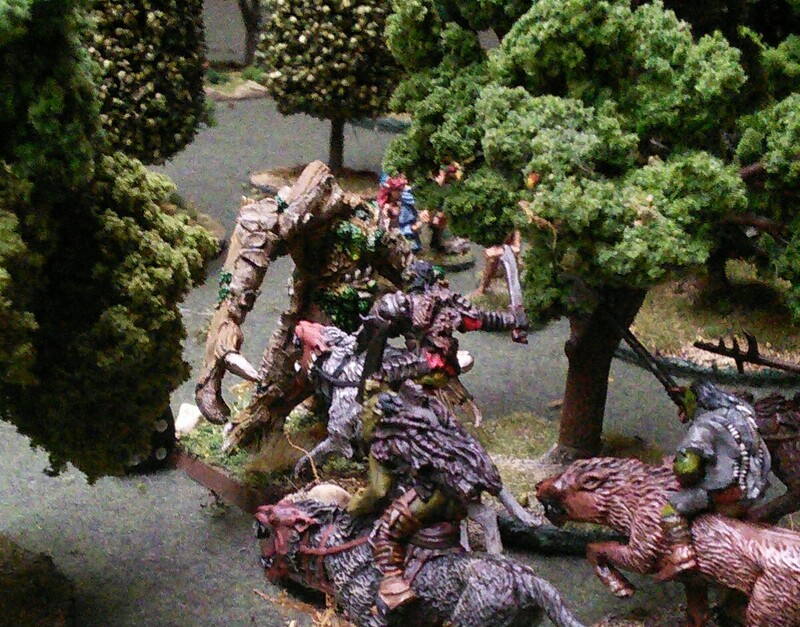 Dan's dwarves managed to get in on the kill for Treeman. 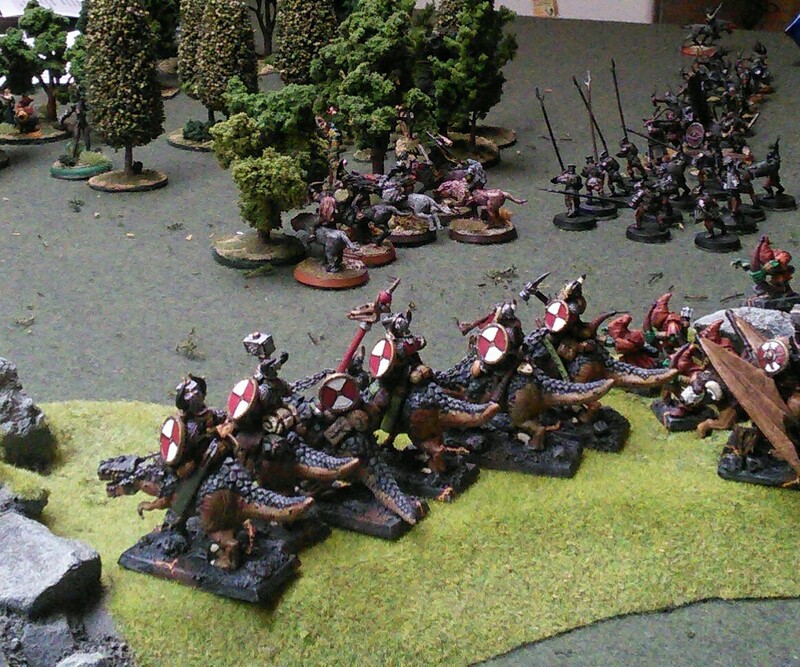 The lizard riders charged forward to attack more Riders but then got flanked by Treegirl and destroyed. 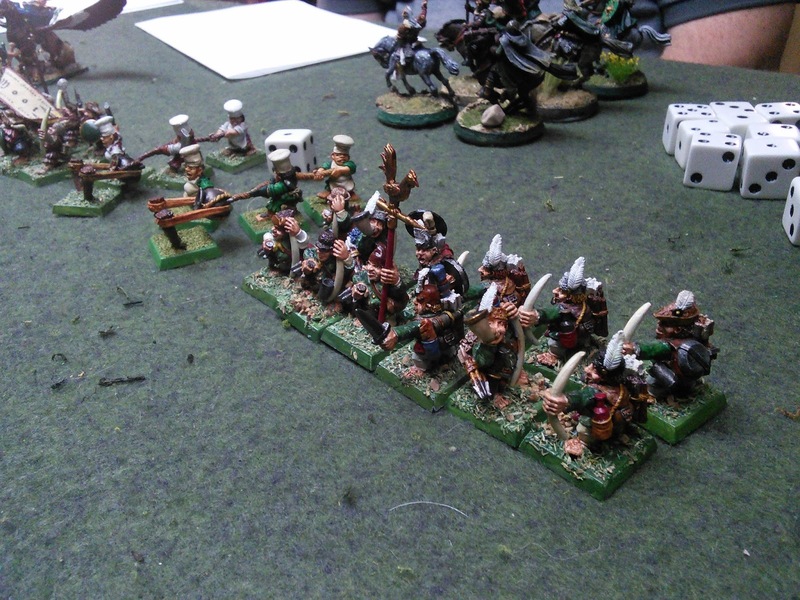 This left Dan with his goblin scouts and a unit of rocket launchers who stood around watching all night. So the Faeries lost the woods. The Uruks were happily burning things. 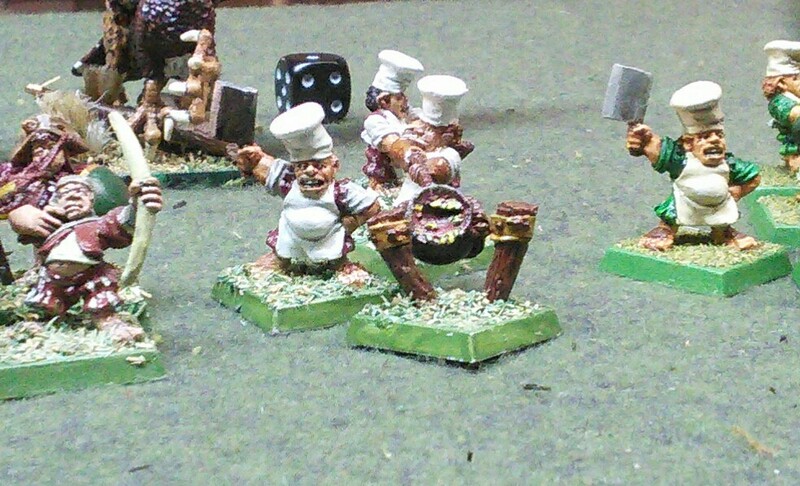 The dwarves were kind of beaten up. The Black Company was destroyed. The hobbits were the big winners really. 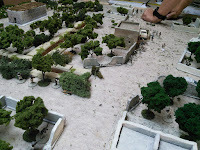 On the Saturday the Padre and I played some 5Core. A Presence Patrol of a section of Canadians (plus the Lt, WO, interpreter,CIMIC officer and GPMG team) and two sections of ANA have to patrol a village. Conduct a shura, look for weapons, get Intel on the Bad Guys. 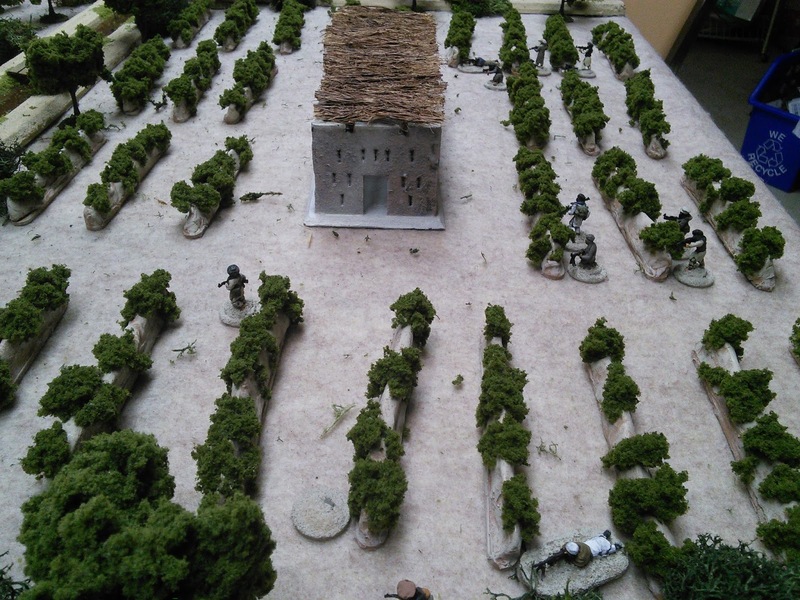 The Padre was a sport and role played the scenario, pressing on with searches and questions in the market while aware of my attempts to infiltrate fighters through the grape mounds and pot field to protect the weapons cache in the grape drying hut. I let him move everyone until a contact. 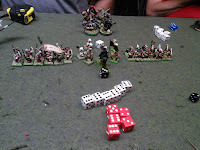 But I hampered the insurgents with rolling for activation. 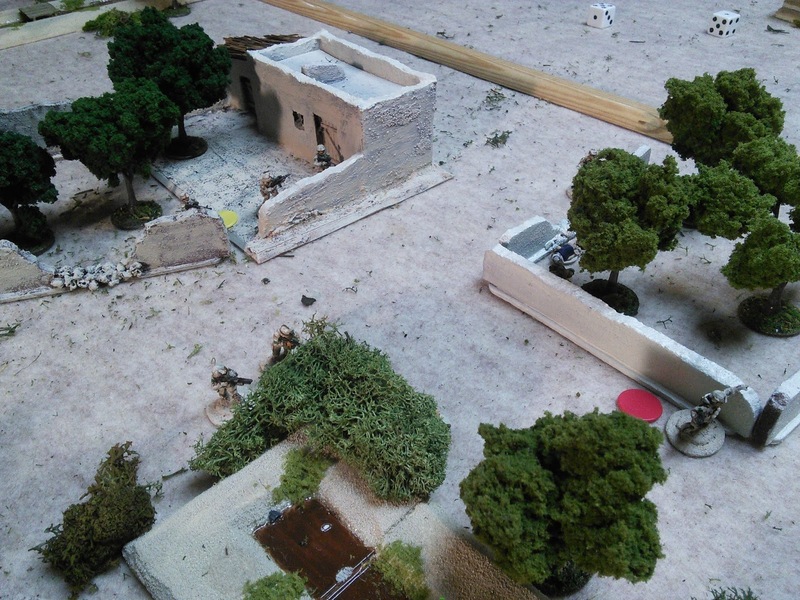 I wasn't quite in position when one team rolled a '6' -firefight. So I figured Haji got excited and started the shooting, snapping off a burst at Pte. Lewis keeping watch at the edge of the market. Lewis scrambled back along the wall shaking the dust off "Jaysus boys! Did ya see that?!" 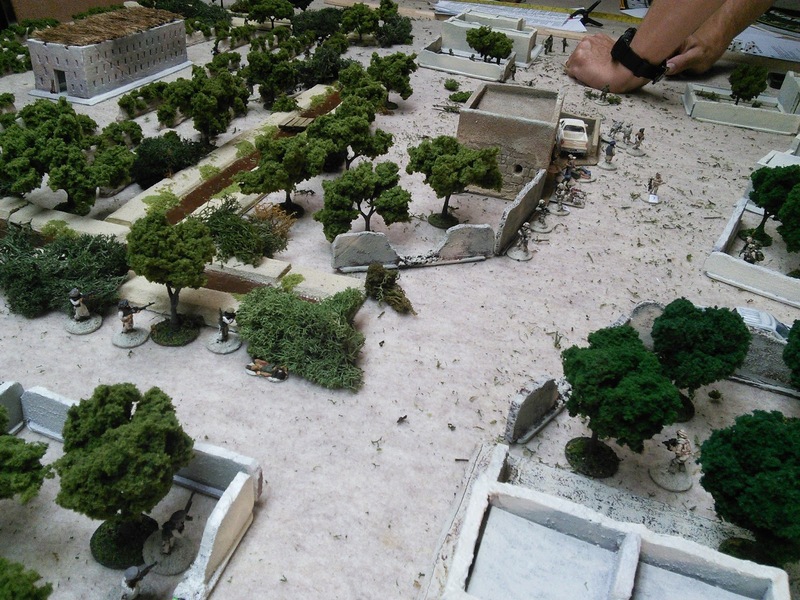 The GPMG set up in an orchard returned fire, killing Haji. 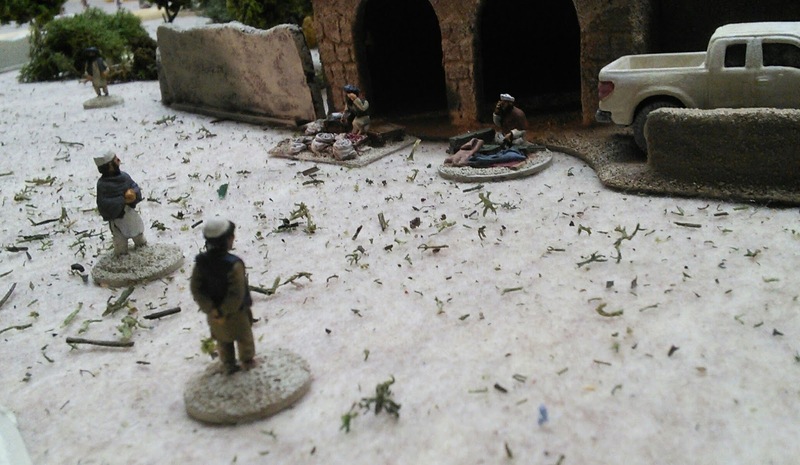 Pte Lewis continued to have a bad game, he would be consistently panicked when shot at and have to rally back into the fight. 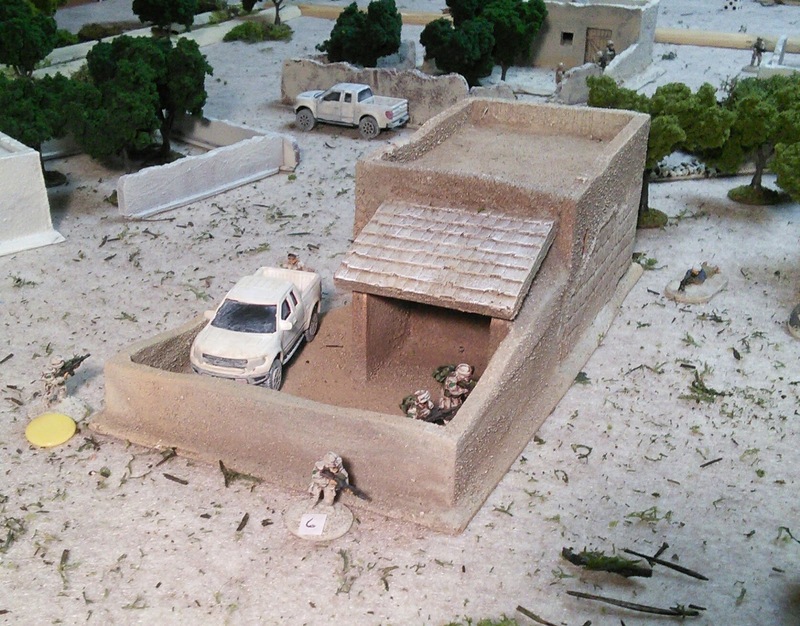 The Warrent is going to sit him down for a talk when they get back to the FOB. The Padre had one fireteam patrol along a ditch and then into a compound where they could effectively cover the ISAF left and block my section from the pot field. 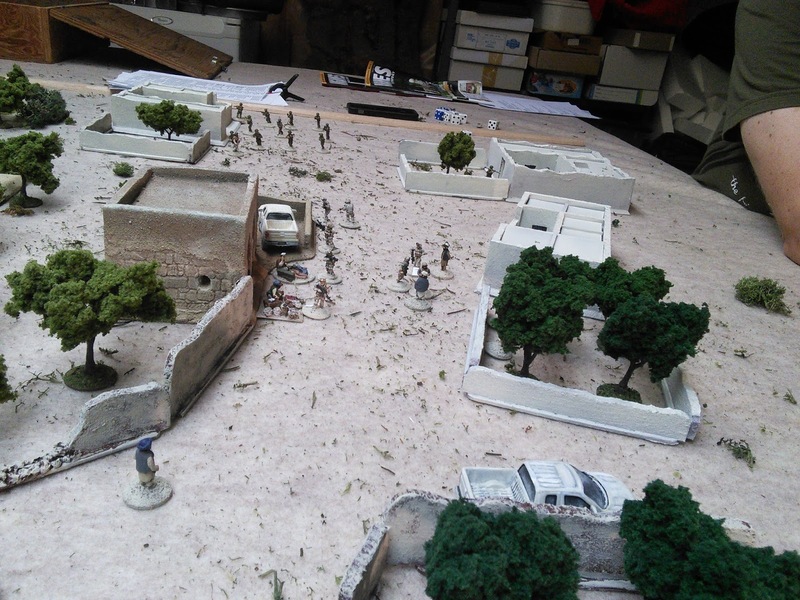 RPGs caused a bit of concern but he found that the grenade launcher was very useful for getting at insurgents hiding behind walls. Eventually my section got driven back into the pot field as the Canadians aggressively took the fight to the enemy. 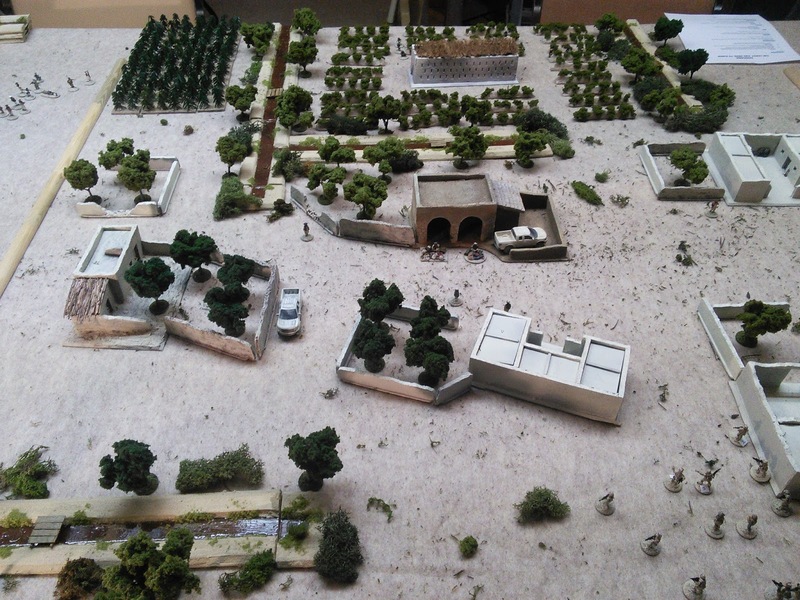 In the centre the other fireteam and platoon HQ were holding the market and supporting the ANA on the right. The casualties and panic results kept piling up among the grape mounds. Two of my fighters bled out. Maintaining any sort of coherent firing group was impossible. 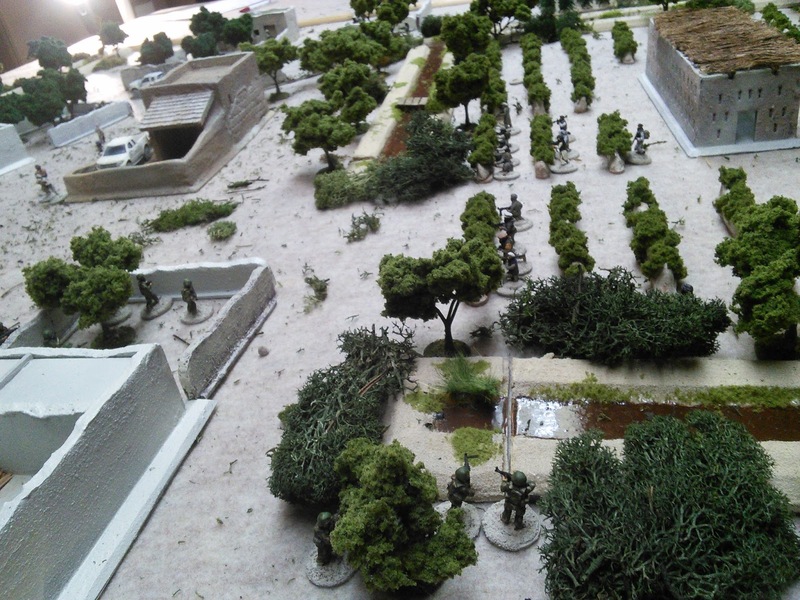 I got a '1' -scramble activation, and as a last gasp I tried to push my remaining fighters up the centre to take the market building but they got shot down around the foot bridge. Even the CIMIC officer fired her weapon. With the last few rounds before I retired, a stray AK slug took down the no. 2 for the C6 team. 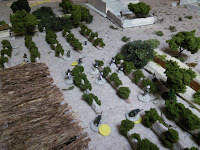 The Warrent rushed off to set up the medevac LZ while the Lt and gunner started dragging their comrade out of the fight. 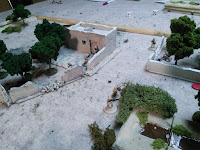 A good game. 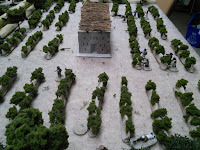 The Padre found it challenging and I satisfied my main objective of giving the rules another go. I probably needed another section of Taliban or a dicker or suicide bomber to set off an explosion in the market pre-ambush for scenario balance. Using my Jump Off Points for some more randomized insurgent appearance might have added to the tension too.